These guys were a class act an we had an awesome day! The weather was blue bird today but the fish played along as we caught nearly 40 bass with a few in the 4-5 lb range. I learned a few things today from the fellas as they have both been married nearly 50 years. The fish are moving up to spawn as you can see with the fat bellies on these fish. The fishing will continue to get better and better as the month progresses and we close in on the full moon. 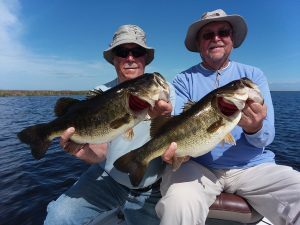 Come join us to catch that fish of a lifetime or just to enjoy a day on the water with friends or family.